Remember, every single gift between now and midnight will be matched dollar for dollar, up to $25,000! As a special token of our gratitude, we’re giving away one of these 3-inch “Actions Not Words” Mayfield motto magnets to every alum who donates $50 or more today! And don’t forget to share your #GivingTuesday message on social media—we’re counting on you to rally your classmates and Mayfield sisters to support the Alumnae Holy Child Scholarship Fund! Mayfield Senior School’s Alumnae Council has taken a challenge to reach to raise $25,000 on #GivingTuesday! 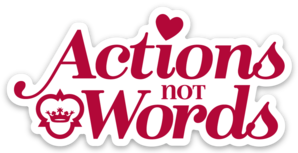 We hope all Mayfield alumnae will step up with #24hoursofactionsnotwords! All alumnae can rise to this challenge by making a gift online or by phone on or before Tuesday, November 27, 2018. You will be hearing from Mayfield Senior School and our Alumnae Council throughout the day with our progress toward reaching $25K goal! If everyone gave this amount, we would hit our #GivingTuesday goal! So proud to have shared in the Mayfield Experience. It stays with you for life. Now sharing this spirit with ladies in Saudi Arabia.